The United States District Court for the Northern District of Florida (in case citations, N.D. Fla.) is a federal court in the Eleventh Circuit (except for patent claims and claims against the U.S. government under the Tucker Act, which are appealed to the Federal Circuit). The current United States Attorney for the District is Lawrence Keefe, having been confirmed by the United States Senate on January 2, 2019. The United States District Court for the Northern District of Florida is one of three federal judicial districts in Florida. 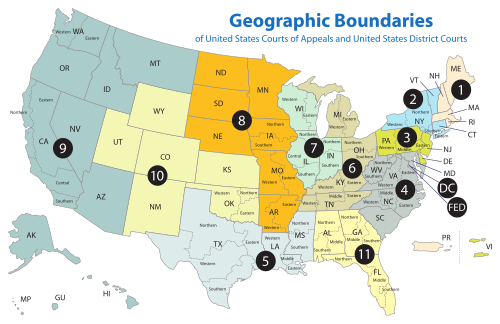 Court for the District is held at Gainesville, Panama City, Pensacola, and Tallahassee. The court serves approximately 1.75 million people . Gainesville Division comprises the following counties: Alachua, Dixie, Gilchrist, Lafayette, and Levy. Panama City Division comprises the following counties: Bay, Calhoun, Gulf, Holmes, Jackson, and Washington. Pensacola Division comprises the following counties: Escambia, Okaloosa, Santa Rosa, and Walton. Tallahassee Division comprises the following counties: Franklin, Gadsden, Jefferson, Leon, Liberty, Madison, Taylor, and Wakulla. 8 Curtis L. Waller FL 1887–1950 1940–1943 — — F. Roosevelt appointment to 5th Cir. 11 G. Harrold Carswell FL 1919–1992 1958–1969 1958–1969 — Eisenhower appointment to 5th Cir.